The base model lx for the 2018 Honda CR-V is powered by a 2.4-liter i-4 engine, 184 PS and 180 lb-ft of torque product and is evaluated to an ape-estimated 26/32 mpg city/highway with MFWD and 25/31 MPG with all-wheel drive. The CR-V EX, ex-L, and touring trims come standard with a 190-PS, 179-lb-ft of torque 1.5-liter turbo-I-4 engine, which delivers 28/34 mpg with front-wheel drive and 27/33 with four-wheel drive. Both engines are supported by a CVT. In Motor trend tests, the 2017 Honda CR-V AWD touring hit 60 mph in a respectable 7.5 seconds and stopped by 60 mph in an impressive 115 feet. The 2018 CR-V comes standard with 17-inch wheels, automatic air conditioning, a 5.0-inch LCD with display of the Center Bluetooth phone and streaming audio, a USB charging port, a pilot information, display and a manual to six lanes adjustable operator seat. The EX model adds a power moonroof, fog lights, push button start, heated front seats and a 7.0-inch center display with Apple CarPlay and Android Auto. The ex-L has a 12-way motor seat, a four-way passenger seat, a leather upholstery and an automatic dimmer rear-view mirror. The top touring model comes standard with 18-inch alloy rims, a hands-free power heck with programmable height, LED headlights with auto on/off, dual-zone automatic climate control, leather-wrapped steering wheel and shift knob, and a 330-watt premium Audio system. If you are looking for bolder styling, opt for the available body side parts and 19-inch diamond-cut rims. The CR-V lineup has two engines for consumers to choose from. The base LX trim is powered by a 2.4-liter inline four-engine coupled with a continuously variable gearbox (CVT), which produces 184 hp and 180 pounds-feet of torque. The rest of the lineup features a turbocharger 1.5-liter four-cylinder engine, the 190 PS and 179 lb.-ft. Torque that is tuned to a CVT. Power can be set by the front wheels or by all four with Honda real-time All-wheel drive with intelligent control. 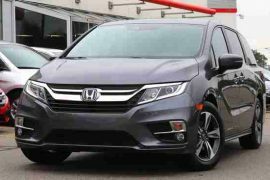 With the 2.4-liter engine and front-wheel drive, the CR-V Gets an EPA-an estimated 26 miles per gallon in the city and 32 mpg on the freeway. Adding four-wheel drive to the crossover will bring fuel consumption around the city and on the highway. The turbocharger 1.5-liter engine is the fuel-efficient engine, boasting a fuel consumption of 28 mpg in the city and 34 on the highway for front-wheel drive models. The decision for all-wheel drive brings these numbers up to 27 mpg in the city and 33 mpg on the highway. As a compact crossover, the new CR-V offers consumers a spacious cargo area. With the seats on the spot, the vehicle houses 39.2 cubic feet of cargo volume, while the room opens up to 75.8 cu. Ft. Folded up with the seats. The 2017 CR-V was a IIHS Top Safety Pick +, and the 2018 model should be the same as it is with all of the latest safety features, including: Brake Assistant, a multi-angle rear-wheel camera, forward collision warning, Lane exit warning, collision reduction Comes the braking system and the disposal system. The touring trim is the range-topping model and carries a starting price tag of $33,625. The touring adds a few tech features, including: rain-sensing windshield wiper, a hands-free power tailgate, roof rails, LED headlights, dual chrome EXHaust finishers, Honda Satellite-Linked Navigation System, and a nine-speaker audio system with a subwoofer. There are no available packages for the Touring trim.